June evenings are mild and bug-free, and offer a great variety of deep sky objects. Skywatchers keen to catch a glimipse of fascinating targets in the night sky will have plenty to choose from this month. June evenings are perfect for skywatching. The temperatures are mild and the worst of the bugs haven't arrived yet. The moon is also out of the way, so the evening skies are dark. The June sky is also perfectly placed to show a great variety of deep sky objects. 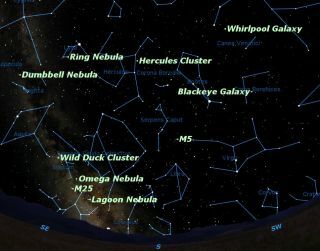 As you stand facing south (in the northern hemisphere), the constellation Virgo (The Virgin) with its galaxies is to your right, and the Milky Way with its nebulas and open clusters is rising to your left; the globular clusters which envelope the Milky Way are directly in front of you. Eighteenth century comet hunter Charles Messier compiled the first catalog of deep sky objects, largely to keep track of objects which looked a lot like comets and interfered with his hunt. They were a nuisance to him then, but now they are a wealth of treats for modern-day skywatchers. The 51st object in Messier's catalog is often called the Whirlpool Galaxy because it is a large face-on spiral galaxy whose star clouds resemble a whirlpool. One of its spiral arms stretches out to touch a smaller satellite galaxy, NGC 5195. The Whirlpool Galaxy is conveniently located just under the end of the Big Dipper's handle. To find it, use the two end stars of the Big Dipper to orient yourself, and sweep for the galaxy with your lowest magnification, say 40x or 50x. If you're new to deep sky observing, you may find its faint smudge hard to see, particularly if you have to contend with any light pollution. Try using averted vision by looking slightly away from the galaxy's location, or tap the telescope lightly to create a little vibration. More experienced observers with larger telescopes should be able to see the arm stretching out to NGC 5195. You can switch to a slightly higher power, 100x or so, to bring out this detail. While in this part of the sky, try to locate Messier 64, which is also known as the Black Eye Galaxy. It gets its name from the clouds of dark material that partly hide it from our view. The Black Eye Galaxy is located between the Big Dipper and Virgo in the rather starless wastes of the massive constellation Coma Berenices (Bernice's Hair). This makes the starhop difficult, but the galaxy itself is quite bright, so you'll know when you reach it. One of the largest is Messier 13 in the constellation Hercules, which is easy to locate in the western side of the keystone that forms the central part of the constellation. This cluster contains about 300,000 stars and appears as a glowing cloud in small telescopes, but can be resolved into stars in larger telescopes. Nearby in the constellation Serpens Caput (Serpent's Head) is another rich globular cluster called Messier 5. Closer still to the band our galaxy forms across the sky are two planetary nebulas. These cosmic objects are shells of gas thrown off by very old stars late in their lives, and they appear to us as ghostly smoke rings in the sky. Messier 57, the Ring Nebula, is one of the brightest nebulas in the sky and one of the easiest to locate. It is in the small constellation Lyra (the Lyre), marked by the brilliant star Vega, in the shape of a bright parallelogram of stars. Messier 57 is right in the middle of the short side of the parallelogram farthest from Vega. It will be smaller than you expect, and you will need about 100x magnification to distinguish it from a star. Look for a tiny smoke ring, but don't expect to see the bright colors you see in photographs. Like all deep sky objects, Messier 57 doesn't generate enough light to trigger the color receptors of the human eye. This nebula is located about half way between the famous double star Albireo and the small but easily recognizable constellation Sagitta (The Arrow). When you get into the Milky Way proper, you can find two distinctive classes of deep sky objects. Diffuse nebulas are the clouds of dust and gas where new stars are formed, and open star clusters are the end product of this star formation: clusters of newborn stars. Over time, these clusters become scattered and eventually disperse. Two of the brightest diffuse nebulas are found just above the Milky Way's core. The first is Messier 8, the Lagoon Nebula, in the Sagittarius. It is easily located in binoculars by sweeping upward through the "clouds of steam" rising from the spout of the Sagittarius "teapot." Messier 8 is one of the brightest of these "clouds." At first, this nebula looks like an open cluster in telescopes, and it takes averted vision to spot the clouds of glowing gas that mark the nebula's location. Again, don't expect to see the colors depicted in photographs. All you will see is faint shades of grey. A bit higher in the teapot’s steam is Messier 16, which carries two names. This nebula is called the Omega Nebula because of its resemblance to the Greek letter omega. It is also called the Swan Nebula because it looks like a ghostly swan swimming through the sky. Finally, deep within the Milky Way itself, you can find two rich open clusters or galactic clusters, which are made up of fewer stars than globular clusters, and are often irregular or ragged in shape. In the constellation Scutum (Latin for "shield"), right under the curve of Aquilla the Eagle’s tail is Messier 11, which is sometimes called the Wild Duck Cluster for its fancied resemblance to a flock of ducks in flight. Lower down, close to the teapot’s lid, is Messier 25. Although this cluster is one of the brightest objects in Messier’s catalog, it has not yet acquired a nickname. In one pleasant June evening, you can sample the best of what Messier’s catalog has to offer. Here's hoping for clear skies!